Tech Trends 2018: What Is The Internet of Things? The internet of things (IoT) is helping digitally transform businesses where data needs to be collected from a number of devices that aren’t easily accessible, or are difficult to continually monitor and repair. Its integration into a wide variety of industries, including traditionally labor-intensive industries, is helping to evolve and modernize workforces, business strategies and the way businesses operate. Companies adopting IoT into their businesses are gaining a competitive advantage over those unable or unwilling to adapt with changing technologies. I’m not the first to coin the idea that the internet of things is the next industrial revolution, but I’m here to back that up. In my mind, the idea of an industrial revolution is interchangeable with wide-scale digital transformation — advancements in technology are worked into business processes to make the business more efficient and give the company advantages over the competition. We think about the concept of digital transformation as one of the modern age, but take the word “digital” out of the mix and it holds true: Businesses have been transformed by the adoption of new tools or technologies for centuries. The first industrial revolution occurred between the mid-1700s and early 1800s, and marked the transition to new manufacturing processes. The use of steam power and development of new machinery led to business growth across the board, with middle class “everymen” finding opportunities to better their job roles and businesses by moving away from the manual processes of the past. The second industrial revolution, the Technological Revolution, occurred in the late 1800s and brought advancements in manufacturing and production technology such as sewage systems, railroad networks and the telegraph. This revolution led to a new level of globalization, as people, goods and ideas were able to travel more freely than ever before. 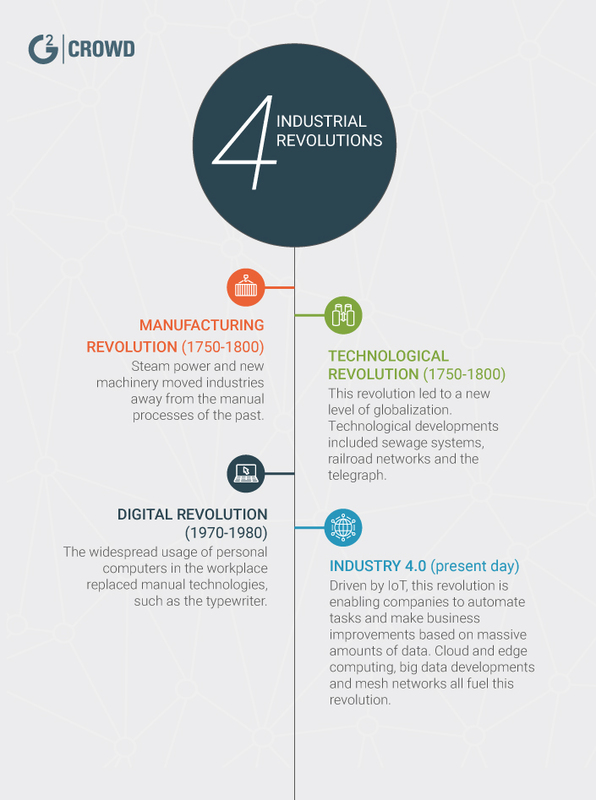 The third industrial revolution is the first which can truly be called “digital.” Taking place in the 1970s and 80s, this revolution is marked by the widespread usage of mini computers and personal computers in the workplace, replacing more manual technologies such as typewriters and carbon copies. And now we are on the cusp of breaching the fourth industrial revolution, thanks large in part to IoT. Each previous industrial revolution has drastically diminished the laborious nature of the impacted industries, and the IoT has already begun to do the same. Not only that, but it is enabling businesses to behave in smarter ways, making informed and proactive decisions that are based on concrete data. IoT has led to a massive influx of data, and the ability to collect and disseminate even more. Personal devices, such as mobile phones and tablets, in addition to an increase in wearables, smart homes and adoption of smart technology in the workplace (including factories, shipping plants, hospitals, etc.) means that there is the potential for more data to be at a business’ fingertips now than ever before, as long as they are open to taking advantage of it. Couple this with the prominence of cloud computing, big data tools and analytics technologies, as well as emerging technologies like edge computing and mesh network, and companies are able to collect, store, analyze, deliver and model in affordable, easily accessible, and, most importantly, fast ways. Practical applications of IoT are already in place in a number of industries, and the possibilities for how IoT can evolve businesses are only growing. For example, farmers can now use sensors to check the well-being and yield of their crops to optimize outcome, rather than relying on historical knowledge, predicted weather patterns and, quite honestly, their guts. Manufacturing companies can monitor machinery performance with the use of digital twins, enabling a proactive, rather than reactive, approach that can eliminate unnecessary downtime and inefficiencies among their workforce. I’ll go into these technologies, and the industries impacted, more below and in the subsequent subtrend pieces to be published later this month. Before diving more heavily into the transformative impact that IoT can have on a business by analyzing some of the trends within the space, I want to cover some of the background and basic information about IoT. While the term is commonly used, it can seem like a complicated concept that scares some people off. The internet of things (IoT) is a network consisting of any object with an on/off switch that is connected to the internet. Machines are connected to other machines and devices via sensors, sharing data and information with one another. This network of devices allows every connected object to share data about the way it is used and the environment in which it exists. IoT enables machines to gather data without human intervention. By connecting things, the need for humans to feed systems information to make the systems more intelligent no longer exists. Instead of a person monitoring, capturing and sharing all of the necessary data in the world, the system of machines instead becomes self reliant, self fulfilling, self monitoring. By connecting devices to the internet, and to one another, information can be shared and used to influence the other devices in the network. This allows our objects to behave more intelligently and, in turn, behave more efficiently. There are connected objects which can gather data and send it back to a network source or database, or to other objects. There are other devices which receive data from a network source or database, and then perform tasks or actions based on that information. And there are other devices which both send and receive information. This data is collected via sensors. 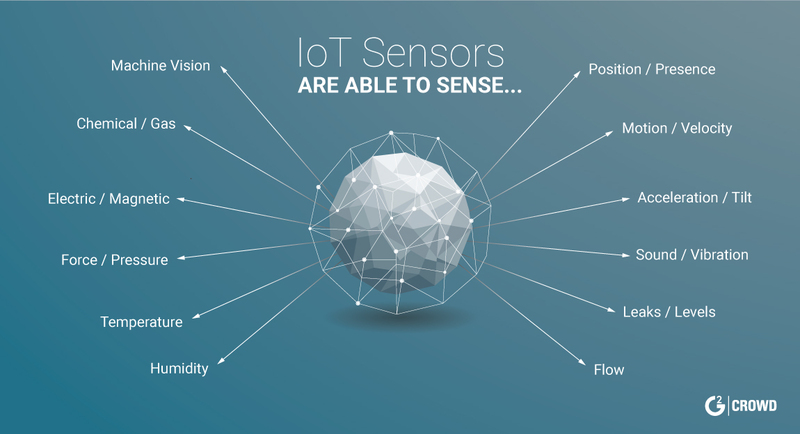 IoT sensors are physical sensors which digitally communicate the data and information they collect via the internet. They are the foundation of IoT which collect and send data from connected devices. Some sensors are universal and used to track a number of metrics, while others are very specific to their application. These sensors are able to transmit data via Wi-Fi, Bluetooth, and cellular, among other methods. While the internet of things (IoT) has been evolving into a more prominent trend in recent years, especially in the industrial sector, it has actually been around since not long after the world wide web was developed and introduced to the general public. The first IoT device, developed in 1990, was a toaster that could be turned on and off over the internet. More references to IoT emerged in mainstream publications in the early 2000s, and the concept began to gain attention and acknowledgment on a global scale. According to Cisco Internet Business Solutions Group (IBSG), IoT was born in between 2008 and 2009 at the point in time when more “things or objects” were connected to the internet than people. The study cites the growth of smartphones and personal mobile devices as a key contributor to the number of internet-connected devices growing to 12.5 billion in 2010, with the world’s human population at 6.8 billion. For the first time in history, the number of connected devices outnumbered the number of humans (1.84 connected devices for every 1 human). IoT made its way into the mainstream vernacular thanks to the proliferation of connected consumer products, such as smart refrigerators, thermostats or connected vehicles. Gartner research shows that the consumer IoT market is booming, with more than 5 billion connected things in use in the world. The same research projects that the consumer IoT market will increase to more than 2.2 trillion U.S. dollars by 2020. But there’s so much more to the application of IoT than simply creating networks of connected devices within your home. The difference between IoT for consumer or business purposes is often delineated by the addition of an “I” — IIoT refers to the industrial internet of things. But extra I or not, IIoT and IoT are the same at their foundation and function. IIoT is simply an industrial-focused subset of IoT that often leads to the collection and distribution of much more complicated data than the consumer version. To clear up any confusion, I thought the differences between IoT and IIoT are worth referencing, but for the purposes of this article and our trends overall, we are going to refer to IoT, even when referencing its industrial use-cases. A mesh network is an interconnected communication network made up of devices and nodes: physical redistribution points, which receive and transmit wireless signals. The value of a mesh network is that it stops the signal attenuation of a traditional network. Instead of there being a single repeater attempting to extend the reach of a wireless network distributing to a number of devices, mesh networks allow the signal to take small steps from device to device, boosting the signal and enabling devices to be connected at a reliable signal strength despite their proximity to the network source. For a mesh to work effectively, these nodes should be relatively unmoving, allowing the network to stabilize and data to be delivered in an uninterrupted stream. Mesh networks are applicable in business in any situation where a series of connected devices is required in a distributed computing environment. Mesh enables the Internet of Things (IoT) by allowing a large number of objects to work in a single network and function at the same level regardless of physical location. As long as the mesh is extended with additional devices, it can continue to carry the original network signal across an almost endless range. These networks are critical to the widespread success of IoT, as they enable devices to be more consistently connected to a strong, reliable signal. Mesh influences performance, and performance is key to a corporation investing potentially millions of dollars into their network of connected machines or objects. A small-scale, consumer-level example of a mesh network is creating a “smart home” with interconnected devices like lights, thermostats and ceiling fans. An entire house could be interconnected through a single access point. On a much larger scale, a wind farm covering over 40,000 acres could be connected via a mesh network, with the furthest windmill from the hub being connected just as strongly as the windmill at the center hub. Edge computing is a mesh network of data centers which process and store data locally prior to being sent to a storage center or cloud. This means that storage and data are brought closer to the actual object, enabling computing to be conducted closer to the data source, and then having that data also transferred to a central repository. Edge computing enables IoT devices to process data closer to where it is created, rather than sending it to a central data center or cloud right off the bat. By storing some data locally, it speeds up the process of gathering and sharing the large amounts of data that can be associated with an IoT-connected device. Edge computing is evolving around the growth of IoT sensors to move much of the processing nearer to the sensors themselves to increase efficiency. Since IoT devices often exist in areas where connectivity is unreliable, edge computing decreases the amount of time it takes to store and process data from IoT devices because the data can be processed before traveling all the way to the cloud or data center. A digital twin is an exact digital replica of a product, process or service. This living model creates a thread between the physical and digital world. By connecting physical objects and their digital twins, companies can monitor systems, collect real-time data, analyze that data and adapt business processes accordingly. Digital twins originated with NASA to help monitor, modify and recommend repairs on spacecraft that were out of reach for engineers to keep track of. The technology has implications across a wide variety of industries: From a HVAC technician visualizing and predicting maintenance on the fan motor of an industrial cooling unit, to a manufacturer testing the impact of introducing a new packaging machine into its shipping processes prior to actually implementing the machine in real life, digital twins enable businesses to conduct tests, and make smarter and better-informed decisions in the digital world before implementing them in the physical. IoT analytics is an important aspect of all of the subtrends, and will be referenced in relation to them in each individual post. As mentioned previously, much of the power of the internet of things (IoT) for businesses is the data gathered by sensors. Sensors can collect hundreds of thousands of data points every day, but companies can’t truly reap the benefits of that data unless they can analyze it in a consumable form, and use it to inform future business decisions or processes. That’s where IoT analytics tools come in. 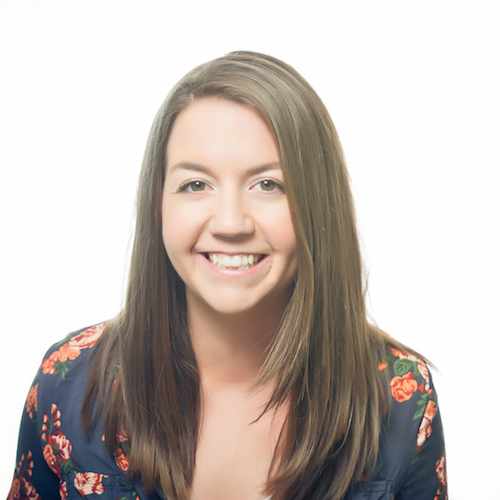 Often, sensor data can and should be coupled with other types of data, such as image and video analytics, geolocation information and machine log files. Together, these can paint a more complete picture of not only a physical object, but also how humans and environment are interacting with those objects, bringing context to the data that’s collected. IoT analytics can often be managed by business intelligence platforms, which help to merge sensor and machine data with other business data, for example from a company’s ERP system, CRM software or supply chain suites. As the data from sensors can be high in volume, big data analytics tools can help businesses digest data trends, patterns and anomalies, and prepare the information into understandable data visualizations.